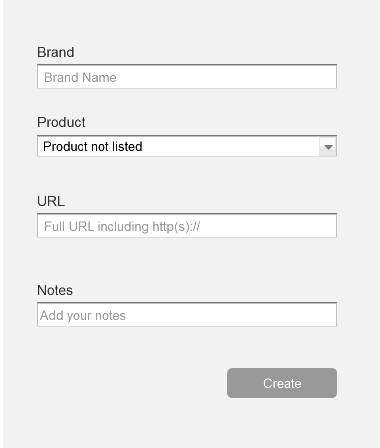 I have a form that allows a user to enter a product link, previously they had three fields: a brand and URL were required, and an optional notes field. They get the URL from another system and after observing user behaviour I found that they were almost always entering an ID from the other system in the notes field. To make this process less prone to human error, I constructed an API that allowed the form to obtain a list of products from the other system, the user selects the product from a list and it automatically fetches the correct URL, correct ID which it adds to the notes field, and allows for some additional functionality using extra information it can gather from the API. I have added the form to use this method above the original form, and explained to the users that it is preferable to use this one where possible, and to use the old form if custom data is being entered that does not fit the model employed by the new form. I thought this was simple enough. However, I have witnessed users getting confused and doing all sorts of silly things. Entering a URL the old way then selecting a product, clicking the wrong 'create' button etc. How can I make it more obvious that these forms are exclusive, only to use one or the other? I have considered hiding the old form (with the 3 fields) unless a button is clicked to show it, or maybe use tab controls, but I feel these options make the forms less accessible. Understanding the requirement, the user has to first browse through the product list within the drop-down Product to check for his product and only if he doesn't find the product on the list he has to input custom data. Hence, it is not ideal to use a control to choose between the forms. Add an option "Product not listed" within the drop-down Product. Only when this particular option is selected show the fields to enter the custom data. This way you can eliminate the confusion caused to the users and improve the user experience as now the users made to choose between the forms themselves by only using the information they have instead of directly making them choose between two forms displayed. I guess it depends on how often do clients input custom datas but, you could keep the newer(Automated) form 'open/shown', then have a text link/checkbox, like 'custom data?' to access the old form, but instead of opening another line of fields, i would replace the "Product" select with the "URL" and "Notes" fields. Not the answer you're looking for? Browse other questions tagged usability forms user-behavior or ask your own question. Should I explicitly state that a form field only accepts a specific input format?